DO-90080-00 was succesfully added to your cart. Timer counts down from 24 hours. Built-in alarm for both temperature and time—once the alarm sounds, the timer counts up from set point. Display pivots on magnetic stand or folds flush with stand for convenient storage and wall mounting. We have several in the lab. Is there really no way to turn it off unless you remove the battery? There is no on/off switch, it will always be on. How fast does this update ? I need it to measure transmission fluid temperature while I am adding fluid to my car. The temperature reading is updated every second. Can the cable as well as the probe be immersed in hot (220 F)liquid? Yes, the probe and cable can be immersed in high temperature fluids, although they warn against moisture at the probe/meter junction could result in inaccuracies. 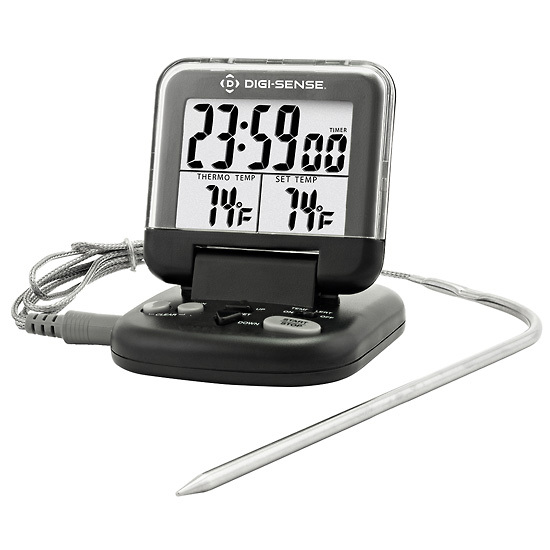 Will this product store and display high/low temperatures over time? This unit doe snot have a memory or minimum/maximum feature. Please call or email us to let us know what all you may need, so we may suggest an appropriate unit. I need a probe only for replacement. What is the part number and price. Please see part number 90080-05 for the replacement probe. Price may be found on the product page. Is this thermomenter ISO calibrated? This unit comes factory calibrated but if you need an ISO and NIST certificate you will need to purchase the calibration using part number 17101-61 in addition to the unit. Works Great! Makes cooking a roast or smoking simple. I bought these for use with my charcoal smoker in my back yard. I love it. It sticks nicely to the outside of my smoker (won't stick to Stainless steel of course). I purchased two so I can keep track of my Ribs and my Brisket at the same time. This way I don't open it up and loose the heat just to check. I also used this on a Ribeye roast in the oven. Perfect! Did what i wanted it to do, very nice. Excellent product. Very useful when running short experiments. The thermocouple and wire are steel/ steel braided but the socket is plastic, so protect it from organic solvents. The manual states "probe may be immersed in water", however, I believe only the solid steel portion of the probe, and not the braided steel cord, may be submersed. I've had 2 identical probes become defective after submersing the probe and ~6 inches of the cable in boiling water for ~60 minutes.